Meet our amazing VagaGuides, the award-winning team of tour guides who’ll be leading your Vagabond tour of Ireland. Our VagaGuides have the best job in the world. They roam Ireland, hiking, horse riding and laughing their way through stunning landscapes. More importantly, VagaGuides get to meet wonderful guests like YOU! All of our tour guides love to share their knowledge of Ireland’s history, culture and landscape. Our Vagabond and Driftwooder guests are always amazed at the knowledge and enthusiasm of our tour guides. We want you to love Ireland as much as we do! Our VagaGuides work hard to answer your queries and make you feel at home and relaxed throughout your trip. Our tour guides are carefully selected and trained (to be naturally funny and entertaining). This ensures you’ll never forget Ireland or Vagabond! Founder and owner of Vagabond Tours, Rob is originally from Scotland but has lived in Ireland for many happy years. Rob started Vagabond after travelling in Southern Africa and thinking that a more active adventure tour of Ireland would be a great idea. Rob is an outdoor enthusiast and also a keen amateur historian (with an MA in Modern History). This is the perfect job for him and Rob still can’t believe he’s getting away with doing it. Warning: please do not ask Rob to sing on tour (for your own sake). Larry came to Vagabond after a (really) long career in public service, which included working in Namibia and Bosnia Herzegovina. His last position was in a public order role, but since joining Vagabond we have completely re-trained Larry and his use of the taser with customers has reduced significantly. An enthusiastic singer and supreme teller of jokes, Larry also has a fantastic first-hand knowledge of Ireland and its past. Larry is originally from County Clare in the West of Ireland and is a keen supporter of their Gaelic games teams, just warning you…In 2015 Larry was appointed General Manager of Vagabond and we are delighted to have him on board in this role. (He is banned from singing in the office, but we can’t seem to stop the ‘jokes’). A guy that people tend to look up to, standing 6’5″ in his socks, Russ is a fully trained ambulance medic and is also handy enough with a chainsaw (he has trained in horticulture and worked as a landscape gardener). 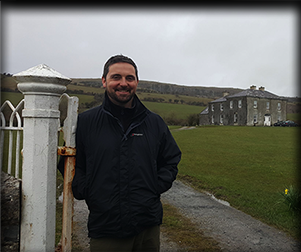 Having travelled extensively through Europe, North America and Australasia, Russ now loves showing people around Ireland and sharing his passion for, and knowledge of, his country. Russ’s calm and professional style instantly makes his passengers feel at home and welcome. We are also proud to say that Russ was shortlisted by Outside Magazine in the UK as one of the top 20 guides in the world. This makes him the tallest-shortlisted guide ever. Russ was recently appointed Vagabond Transport and Operations Manager. Thus, by reducing the amount of time he is on tour, we hope our guests will have some chance of actually getting into photos. Mark, from Naas, Co. Kildare is a true Vagabond, having travelled and cycled almost all over the world, including Iceland (with his bike) and Antarctica (without his bike). In fact, in 2009 Mark embarked on an amazing journey to be the first Irishman to cycle around the world, which he duly completed. It was an amazing achievement. Since then he has gone on to get married and become a father and he recently completed the prestigious National Tour Guide Training programme. Mark once had a job as the lion feeder in the circus, a job many would give their right hand for. Mark’s humour, charm and attentiveness blended with his enthusiasm for Ireland (and for most things, actually) will make you feel that you arrived home in Ireland and are travelling with an old friend. Special Sean is from Galway, the city of the tribes (and hippies). He attended college at West Wales school of Art doing an honours degree in photography but got restless with wanderlust and hit the road. Since then he has traveled to 22 countries and counting (despite being scared of flying). Sean’s passions aside from wandering around the world are film/photography, surfing and mountaineering. He has surfed, hiked, kayaked and climbed all over Ireland and you may even spot him trying to climb up a cliff face on tour. Sean’s favourite part of Ireland has to be Connemara. It is a photographer’s dream location and is also the birthplace of his father who never learned English until he started in school. Sean also enjoys a good musical. Aidan was the first Irishman to conquer Everest barefoot. He can also pat his head whilst rubbing his tummy. He joined Vagabond after retiring as a sergeant in An Garda Siochana (the Irish police force) and we have also been delighted to help re-introduce him into society (he has made amazing progress). During his time in uniform he served in the traffic corp and the Former Yugoslavia on UN Policing duties, he also ran the Force’s mountaineering club for many years and hiking and mountaineering remain one of his passions in life. He also used to like making jewelry. Tim (far left) has mountaineered across Europe, America, Middle East, Nepal, Ireland and the UK and has worked as a Mountaineering Instructor / Guide for over 20 years. He loves coffee and can eat seafood chowder 7 days in a row for lunch when touring the west or south west of Ireland. He has a Great Dane that he would love to bring on tour with him…but he would take up at least 3 seats – as will Tim if he eats seafood chowder every day on tour. Tim also trained as a luthier (musical instrument maker) under the famous Paul Doyle of Galway City, making mandolins, mandolas, bouzouki’s and classical guitars. Recently a customer suggested that Tim looked a bit like George Clooney. A bit. A direct descendant of one of the most famous (and infamous) women in Irish history, the 16th/17th century pirate queen, Grace O’Malley, Bébhinn hails from Clare Island of the west coast. When not Vagabonding or Drifting, she can normally be found surfing (expertly) off the west coast or skateboarding (not so expertly!) into the nearest wall, or kicking a coconut around a Thai beach. Behind those boyish good looks, quietly spoken manner and permanent smile lurks a heart of…gold. Another who has spent time working and living in the southern hemisphere, including Asia, Australia and New Zealand (where he was a Beekeeper). As a youngster Darran was often seen on TV is the hit Irish TV agricultural soap opera – Glenroe. It was a bit like ‘Dallas’ set in an Irish farming community, without Cliff Barnes. It might explain why he likes talking to donkeys. 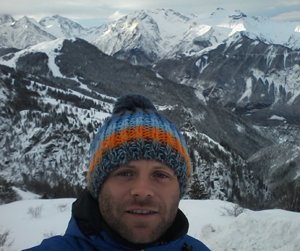 At the age of 9 months Darran got his first case of altitude sickness when his parents took him walking in the Alps, but not to be deterred, he gained a BA in Outdoor Education and Leisure has the Mountain Skills Qualification and Mountain Leader training. He is also good at football (soccer). Denise is from County Mayo, in the west of Ireland and is quite literally emerging from a career as a sound engineer. After many years spent working in sound-proofed, windowless recording studios Denise felt it was time for a more active lifestyle with like-minded people. She has travelled extensively and taken part in some pretty cool trips, such as horse trekking through the Grand Canyon, Husky sledding up in the Arctic in Finland, trekking the Andes in Peru to name a few. Like many of our team, Denise is also interested in music and plays the mandolin and violin. She does requests. So-called partly because she is from Cork (red is the county sporting colour) and partly because she is one of the endangered species of redheads. Ed exploded onto the Vagabond scene in 2016 and has become an integral part of the team. Known for her quick and easy wit and laid back manner. She has years of experience in leading groups, working as a lifeguard and being generally adventurous. In addition to an honours degree in Outdoor Education and Leisure, Ed is a qualified surfing instructor, lifeguard, cave leader, climbing instructor, speedboat driver and limbo dancer. She also has red hair, did we mention that? You need never worry about bad hair days on tour if Carmel’s your guide, because not only is she an experienced outdoors instructor, she is also a qualified hair stylist! From County Mayo in the far reaches of the west of Ireland, Carmel attended university in Galway City. Here she showed great tenacity in resisting the lure of its vibrant nightlife and student social scene, to gain an honours degree in Microbiology. With a passion for watersports and horseriding from an early age, her “I’ll go where the wind takes me” philosophy makes her an ideal VagaGuide. She also has a beautiful singing voice and a great repertoire of songs and counts breakfast and dessert as the most important meals of the day. Sian is a seasoned world traveller. She previously worked for a major international travel company throughout Europe and parts of North Africa. She is also our very own version of Mary Poppins! Meanwhile, her own wanderlust has taken her throughout southeast Asia, where her altruism manifested itself in her working as a volunteer in animal sanctuaries and shelters. In common with all the team, she is a lover of the outdoors, with particular focus on watersports. We still can’t get her to demonstrate her Greek tour rep dance though! Having a personal history that many of Irish descent will empathise with, Jason emigrated from the quiet of rural western Ireland to its very antitheses – London. Having spent his formative teenage years in England’s teeming capital, he returned to Ireland to study for his degree in Outdoor Education. In the years since, he has gained vast experience in guiding in the outdoors, as well as doing a stint teaching English in Vietnam. He can instruct in mountaineering, surfing, kayaking and sailing. He is also a qualified beach lifeguard, but we don’t allow him to pack his Speedos whilst on tour. As you can see from his profile pic, he finds it hard to persuade his friends to go mountain climbing with him and has to resort to selfies. Kim transfers her fun-loving and energetic spirit to everyone on tour. She holds a degree in History and Archaeology, yet has also completed a course in animal welfare. The latter comes in useful when administering to her fellow guides the morning after Team Vagabond’s end of season ‘review’. But, we keep finding ancient stones and stray dogs in the front seats of the vehicles each time she finishes a tour. Her ability to lead is long established, going back to when she was the head prefect in her final year in secondary (high) school. We are still trying to wean her off sending notes back to the principal’s (aka Rob) office. John is a curious fish, we are not quite sure what to make of him really. He seems like a good guy and is certainly a fantastic guide, but we think it may be a cover for his secret life as a superhero. His passion for Ireland, and his knowledge and professionalism is second to none. Not to mention his humour and way with words, but he seems to have scant regard for financial reward – leading us to think he may be Ireland’s Bruce Wayne. By day he does an amazing job bringing Ireland to life for his guests – and night he is saving the world from crime. (Oh, he is also studying journalism, has years of experience in guiding and working in the travel industry and can speak 14 languages). When Tadhg told us he often sleeps with his eyes open, we knew he would be perfect for Vagabond. 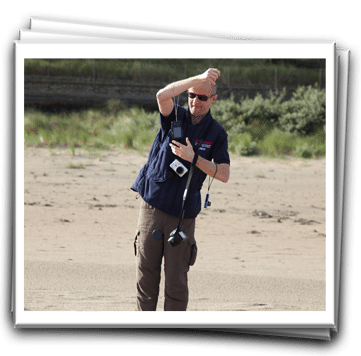 Hailing from West Cork (yes, another one) and having spent much of his working life instructing people on the water and in the mountains, and with the qualifications to match – he is talented, an experienced group leader and excellent company. Tadhg and his family have also been involved in marine conservation for over 25 years and in fact they are currently building an aquarium in Bantry, West Cork. We should warn you though, that there is a certain sense of mischief about Tadhg, a twinkle in his (never blinking) eyes – be prepared for a fun-filled experience. who has one of the best jobs in the world! 7 am: Leap out of bed/run outside into the bright sunshine. 8 am: Legendary Irish breakfast. 8am – 6pm: On the road. Big Jeep. Great gang of people. Hit the beach. Gaelic football or ‘vagaball’. Tell some jokes/hear some jokes. Walk in the Mountains.Wave at less fortunate tourists.Off-road down the beach/through river/up mountains.Stunning castles/ancient sites. Loads of history etc.Horse-riding/swimming/surfing/chilling out.Enjoy great scenery/view from office window. Have a great laugh. 7pm: Off to the pub. Good Food. One Pint. Music. Mighty craic (fun). It’s a dirty job but someone has to do it.